Posted: Friday, August 26, 2016. 12:19 pm CST. By Aaron Humes: BELMOPAN – The Belizeans standing in broiling Friday sun at the seat of their nation’s government made clear that they are mad as hell, and not going to take it anymore. “It”, they perceive, is the slippery slope of moral and social decay to set in with permission for LGBT adherents to practice their lifestyle in private, and the other attendant ills. Asked if this week’s events have surpassed his wildest dreams, Pastor Louis Wade sanguinely responded that he expects that next month. What he does not expect, despite many in the crowd demanding it, is for Government to appeal Chief Justice Kenneth Benjamin’s August 10 decision in favor of Caleb Orozco – because, eight years ago, there was an “agreement” with the University of the West Indies and UNIBAM, Orozco’s organization, not to stand in the way. This demonstration carried wider support from groups such as Citizens Organized for Liberty through Action (COLA), whose president, Geovannie Brackett, said “civil disobedience” may be coming if Government doesn’t listen. Patrick Menzies, whose organization has given Government until the end of the month, told us that he personally is tired of making “requests” to Government; these are the demands of a people who voted for change and have not seen it. Echoing those sentiments are many we spoke with, ordinary Belizeans who want to live in law, order and peace. 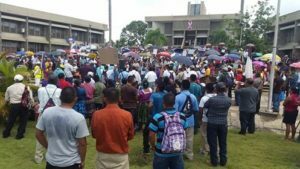 About the same number – 1,000 – of persons attended today’s and Tuesday’s protests.